DAS is a comprehensive system that incorporates weather data from WSU-AgWeatherNet (AWN), forecasts from NOAA’s National Digital Forecast Database, historic weather data from Daymet, and other information sources such as the WSU Orchard Pest Management Online. DAS attempts to support reasonably common smartphones and tablets (iOS and Android) as well as desktop computers in all functions. As designed, DAS also has a data/account management subsystem that simplifies use for decision makers and allows them to tailor the information they receive. DAS was launched in 2007 with 12 models; it now includes 23 models with more in the pipeline. For the first 7 years, DAS was supported on competitively acquired grant funds from state, federal and industry funds (sources are shown in the pie chart - none of the WSU faculty time is listed). Grants are provided by a particular agency to further the goals of that agency that also help WSU meet our land grant mission. These funds are a legal contract ensuring that WSU will meet the objectives outlined in the grants within a particular time frame (generally 1-3 years). However, these grants do not allow obligations once the granting period is over and funds are expended. 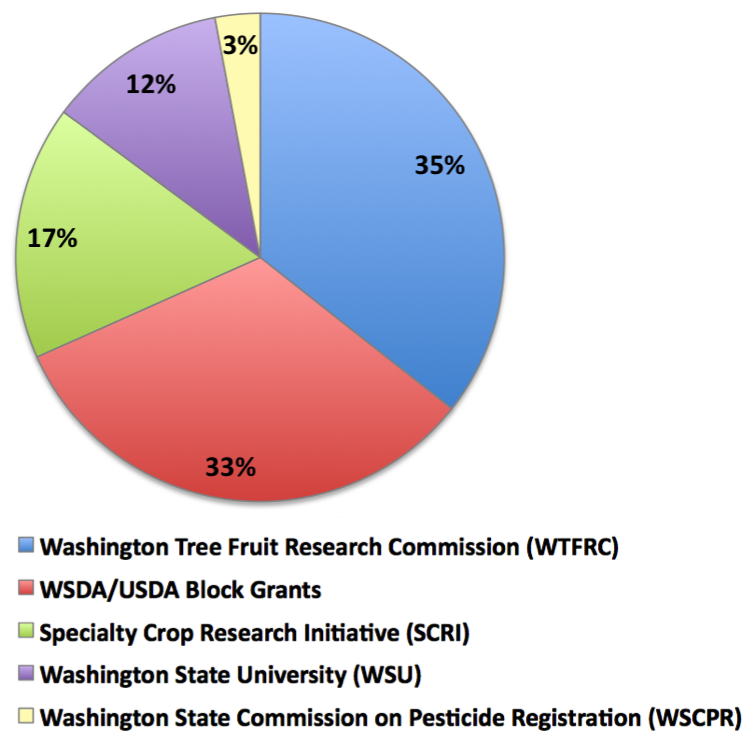 The granting agencies (including the Washington Tree Fruit Research Commission) made it very clear that they will not support projects that have any maintenance of DAS associated with them. Nor will they pay for the implementation of new features based on previous finished research. Therefore, alternative funding sources are needed to support the upkeep and expansion of this service. We have set the fees based on previous use patterns and with the goal of meeting the program’s needs to just run the system and to keep the improvements coming. A flat fee was set for all users, so that everyone pays the same amount for the services they use. Previous DAS user surveys have shown consistently that users estimated the value of using DAS at ~$75/acre. Thus, our current cost of $150.00 per station per year would be quickly made up even if a grower has just a small orchard. There may be some price adjustments in the future to make sure that the cost-sharing is as fair as possible while guaranteeing stable funding for the program. Each individual making management recommendations using DAS is required to register for an account for the station(s) where management information from DAS is needed. This annual fee of $150.00 per station provides access to all models and all the synthesized data associated with the site(s).